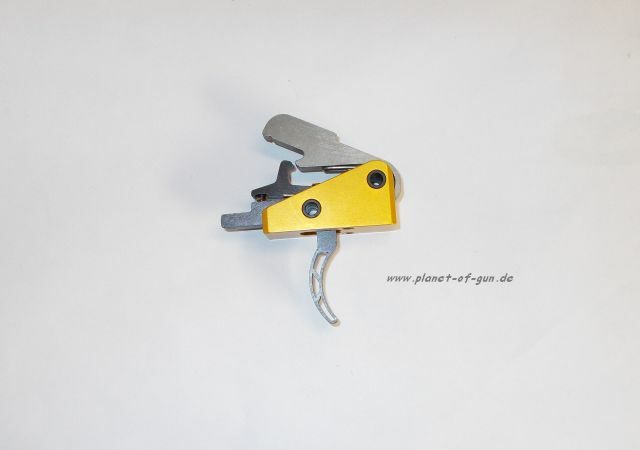 Timney Abzug für AR15 Waffen mit geraden Abzugszüngel und Druckpunkt mit ca. 1.900gr. Funktion NICHT beim CMMG KK System!!! Löst bei ca. 1.700gr. aus! Single-stage trigger offers shorter pre-travel, faster reset, and increased hammer energy. Dual coil springs across the top of the trigger to reduce friction on the sear and increase hammer striking power by 35% over factory trigger. Includes interchangeable color-coded springs to adjust pull weight from 2-1/2 to 4-1/2 lbs. 24 Elite is designed for law enforcement, military, and precision shooters. 24 Competition is ideal for competitive shooters and features further reduced pre-travel and a straight trigger with an adjustable finger pad. Pad can be set at five different positions for enhanced adjustment of pre-travel and trigger weight. Can be installed with or without the pad. SPECS: Frame/Trigger/Hammer/Disconnector - Carbon steel alloy. Mate black finish. Springs – steel. Pins/Spindle/Toggle Shaft - Carbon steel alloy. Mate black finish. Fits rifles with .154" hammer/trigger pins. Can be installed on AR-style .308 rifle that accepts a standard small-pin AR-15 trigger. Hiperfire’s Hipertouch 24 3Gun trigger is based off the popular Hipertouch 24C, but features a curved trigger bow. The 24 3G is a single stage trigger that features an at the wall break with virtually zero creep. Includes 3 user set springs in Light, Medium-Light, and Medium weights. The new ZEV Technologies SSR (Single Stage Rifle) Trigger was designed to bridge the gap between the multitude of two stage triggers intended for duty use, and single stage competition triggers. The ZEV SSR Trigger’s engagement, over travel and reset can be adjusted to personal preference. One of the most unique design factors of the new ZEV SSR Trigger is that all adjustments are under detent retention which eliminates the need for thread locker and the possibility of failure from vibration or improper installation. Adjustable Extended trigger bow Two hammer springs included Each unit ships with two hammer springs allowing for a 5lb to 5.5lb trigger pull weight or a 3lb to 3.5lb trigger pull weight depending on which hammer spring is used. The ZEV SSR trigger bow has been extended for a better user interface allowing the pad of the finger to easily find its natural position when firing. Get the most out of your duty or sporting rifle with the enhanced features of the ZEV SSR Trigger. Complete trigger system installs in five minutes without fitting or modification of parts on the trigger or your receiver. All adjustments are made with setscrews, eliminating the risk of ruining the trigger due to errors in fitting. 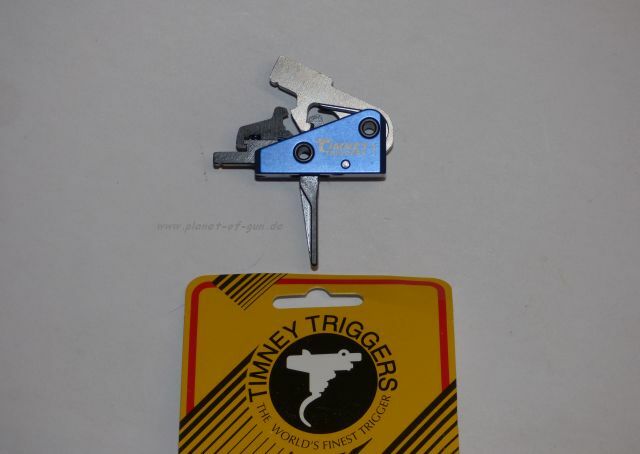 Includes the JP Speed Hammer for fast lock time, plus “anti-walk” pins with button head cap screws for easy removal and reinstallation of the trigger system. Overtravel adjustment screw lets you set your trigger for a clean, crisp, single-stage release. 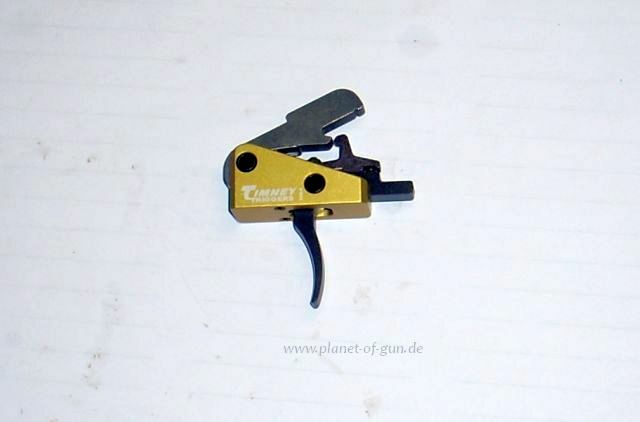 Comes with two hammer springs: install the yellow spring to get a 3 to 3½ pull for competition or recreational shooting with non-military ammunition. The red spring gives a 3½ to 4 lb. pull and more hammer force for use with the harder primers found on military (5.56mm NATO) ammo and for law enforcement duty use. The red spring should be used in any installation on an AR-style .308 rifle. For a heavier, 4½ lb. pull for tactical applications or NRA Service Rifle competition, install the JPS4.5 spring kit. JPFCP-1EZ fits small pin (.154") receivers. SPECS: Steel, black oxide finish. Models available for rifles with .154" dia. (military and current commercial rifles) or .169" diameter (Colt rifles) hammer and trigger pin holes. Measure your pins and select the correct kit. NOTE: Will not fit Colt rifles with pinned-in full-auto sear block. JP recommends JPFC-2 trigger for those installations. 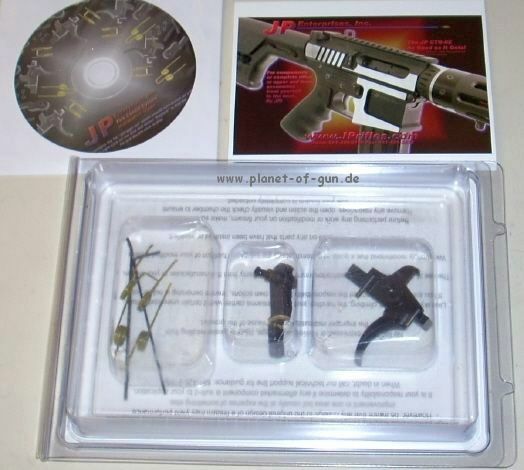 Kit includes trigger, hammer, disconnector/sear trigger spring, yellow hammer spring, red hammer spring, safety assembly, (2) anti-walk pins, disconnector spring, instructions, and DVD with video showing step-by-step installation. Easy-to-fit replacement for factory trigger is fully adjustable for engagement and overtravel, and is available with pull weight as light as 3.5 lbs. Redesigned sear geometry and advanced metallurgy result in a precision-ground sear edge that delivers a precise, consistent letoff and prevents the kind of wear that causes doubling and other problems. Extremely short reset enables fast follow-up shots, a critical advantage on tactical and competition rifles. Machined to exceptionally tight tolerances from hardened steel, and installs in minutes with no permanent alterations to the rifle. Lets you upgrade an AR-15 or an AR-style .308 rifle that uses an AR-15 trigger, while keeping your current hammer and pins. Disconnector spring, engagement screw, and overtravel screw are already installed; also includes disconnector, trigger return spring, hammer spring, and .050" hex key. Use with J.P. Enterprises Speed Hammer (available separately) for best performance. Comes with a standard weight hammer spring, for a trigger pull of between 3 and 3.5 lbs.—perfect for competition and recreational shooting—plus a “tactical” spring that gives a 3.5 to 4 lb. for applications demanding a high level of ignition reliability, including police/military use, mil-spec ammunition with hard primers, and in AR-style .308 rifles. 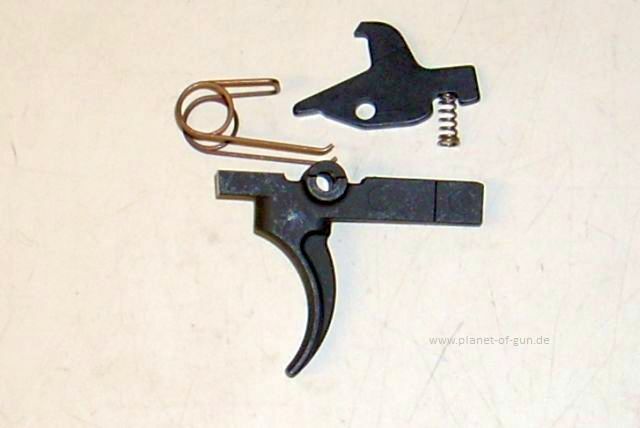 JPFC-1 fits rifles with standard .154" diameter trigger/hammer pin holes. SPECS: Steel, Parkerized finish. 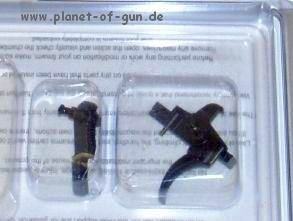 Models for rifles with either .154" (military and current aftermarket) or .169" (current Colt) diameter trigger pins. Measure your pins and select the correct kit. Includes complete instructions and a CD-ROM with 35-minute video showing step-by-step installation. Low-mass hammer delivers a 50% shorter lock time than the standard factory hammer for faster ignition and improved accuracy potential. Designed to work with – and enhance the performance of – the JP Enterprises Adjustable Trigger Kit (available separately). Not for use with the standard factory trigger group. SPECS: A2 tool steel, hardened to Rc 58, Parkerized finish, contact surfaces in-the-white. .7 oz (20g) wt. Separate models for rifles with the .154" (military and current aftermarket) or .169" (current Colt) dia. hammer pins. Measure your pins and select the correct kit. SPECS: Steel, black, matte finish. 2 lb. (1 kg), 3 lb. (1.4 kg), or 4.5 lb. (2 kg) pull weight. Includes hammer, hammer spring, trigger, trigger spring and sear engagement screw. Available to fit rifles with .154" or .171" hammer and trigger pins.